"For some reason," said Andrew Needum, a firefighter from Texas who was traveling with family, "it was me that day." It was before 10:30 a.m. Tuesday when Andrew Needum, a firefighter from a Dallas suburb, boarded Southwest Flight 1380 with his wife, their two young children and his parents. They were rushing that morning to make the flight, and heading home to Texas after their first trip to New York City. There, Needum's parents celebrated their 39th wedding anniversary and he got to shake hands with firefighters and visit the 9/11 Memorial and the New York City Fire Museum. He had no clue that his training would come so urgently into play on the trip back. Needum, 34, is credited as one of the passengers who sprang into action to help a woman who was partially sucked out of the plane's window when an engine exploded after takeoff. She later died from her injuries as the chaos unfolded 30,000 feet in the air, forcing an emergency landing in Philadelphia. "I'm no different than any other firefighter in this country," Needum told reporters Thursday from the Celina, Texas, fire station where he works. "For some reason, it was me that day." Out of respect, Needum declined to discuss exactly what he witnessed while trying to save the victim — Jennifer Riordan, a Wells Fargo executive from New Mexico. But he praised two other passengers — real estate worker Tim McGinty and retired nurse Peggy Phillips — who helped pull Riordan back inside the plane and then performed CPR. The blown engine sent shrapnel through the fuselage and into the window where passengers say Riordan was sitting. Before the pandemonium erupted, Needum recalled how everything was normal. Flight attendants were taking drink orders. He was seated in Row 8, with his 8-year-old son and his father, Tommy. On the other side of the aisle was his wife, Stephanie, their 5-year-old daughter and his mother, Julie. The takeoff was smooth, but about 20 minutes into the flight, Needum said he heard a loud pop. He looked over to his family and oxygen masks dropped from above. As they pulled them over their faces, Needum said he noticed a mother with a baby on her lap, and helped to secure their masks. But then, a greater emergency unfolded just behind him: A passenger in Row 14 was in a life-or-death struggle. He said he looked over to his wife, who immediately knew what he wanted to do — go back there and help. No matter the danger around him, he wasn't going to sit idly by, he said. "I never was in fear of my life," he said. "I'm very proud of him," Stephanie Needum added. "This was a calling that he had, and he did amazing." Needum said he was in awe of how Tammie Jo Shults, the pilot, managed to safely secure the hobbled jet during the emergency landing. Afterward, he said, Shults took a moment to individually speak with rattled passengers. "She took the time to stop and talk to our daughter," Stephanie Needum said. "She was very good to her. They had small talk about the oxygen mask, which, as a 5-year-old, that's what she was most interested in." Shults "comforted everybody," she added. "She's an amazing person." 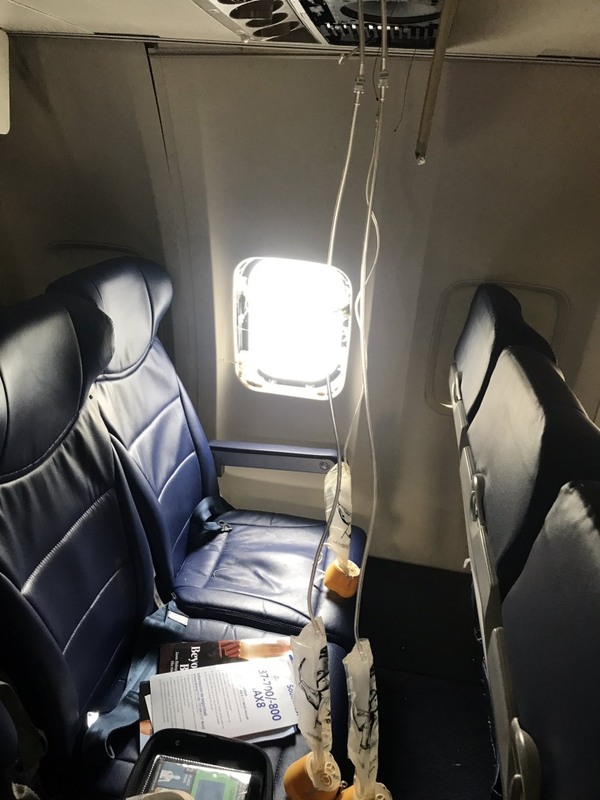 Andrew Needum said he had confidence in Southwest despite the accident, and the family — still unnerved by the experience — decided to fly with the airline back to Texas. The family is still dealing with the trauma of the event. Needum said his children don't want to sit near the window of an airplane. He still thinks of Riordan and prays for her family. "We're still healing," he said. "This isn't over ... but we know we're not alone."